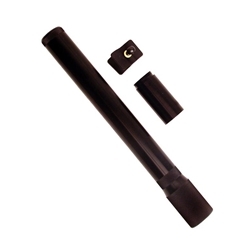 This extension allows you to increase the ammunition capacity of the shotgun. The extension is made of tough 6061 aluminum. This allows the tube to have a large wall thickness to improve rigidity without compromising overall weight. The tube screws down on the magazine and locks the fore end in place. The extension is supplied with a magazine tube spring.